Sumit Huda with his teammates at the MSU stadium after winning the 30 over Cup. There’s a corner of foreign land that is forever India. And if Indians are there, can cricket be far behind? They have kept their passion for the game alive in Russia. Never say no to cricket. Indians would agree, whereever they may be. More than 200 expats from the Indian subcontinent are willing to sacrifice their precious summer weekends to play cricket, says Sumit Huda, head of NSquare group of companies and an enthusiastic cricketer. He is the captain of the team “Omega” and devotes a lot of time to the game, despite his busy schedule. The first cricket matches were played at Moscow Dinamo stadium in 1980s. Now, MSU (Moscow State University) stadium hosts cricket matches. There are two versions of the game played in Moscow – the longer 30 over and the shorter 20 over. 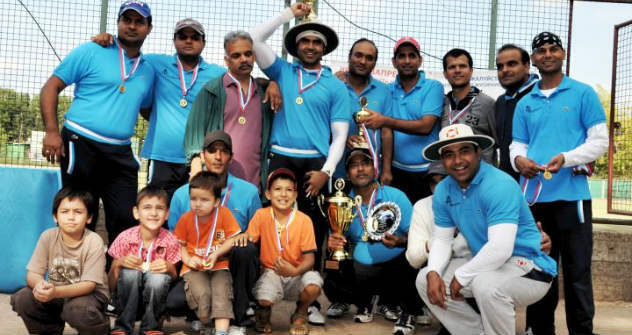 Today, 8 teams participate in the annual Moscow Summer Championship: Omega X1 – 2011 champions of the 30 over format, RCC (Russian Cricket Club) – 2011 champions of the 20 over format, Friends X1, TBA (Textile Business Alliance), Moslions – mostly expats from Pakistan, MCC (Moscow Cricket Club), Mosmongrels (expats from the UK and Australia) and Sprandi – formerly sponsored by the sports goods firm. Cricket is often compared with the traditional Russian ball and bat game called “lapta”. It all started with a few students from India, Pakistan, Sri Lanka and the Caribbean countries in the 1980s. They played with tennis balls and archaic cricket bats, even during the Soviet era in the backyards of their hostels. Organised cricket, however, started shaping up around 2000 when the first tournament with part-sponsorship from Coca Cola was held. Punit Shrivastava, the pioneer of modern-day cricket in Moscow, played a pivotal role in the transformation of cricket in his adopted country. Since then, veterans like Ashvani Chopra, head of the United Cricket League, and several others have spared no time and effort to make this tournament an annual event. Only three teams participated in the inaugural tournament - India X1, Rest X1 and combined Australia-England X1. The game has since moved up: today, the UCL (the United Cricket League of Russia) boasts 8 regular teams. Huda, the winning captain of 2011 tournament, feels that a lot more could be done to popularise the game in Russia. More so, since the International Olympic Committee has officially included cricket in the 2020 Olympics. Huda believes that Russia being a great sports power should not lag behind and grab this opportunity. Unfortunately, in spite of tireless efforts to promote cricket, only two ethnic Russians are regular participants in annual tournaments. For a game to be recognised officially in Russia, more than 50% of the administrative subjects should recognise the sport in some form or the other. It is practically impossible without the support of the International Cricket Council, the sport’s world governing body, and the Russian sports ministry. Do they even play cricket in Russia? Though the ICC sent its representatives to Moscow for inspection, it is reluctant to support the UCL either materially or organisationally. Huda says the main stumbling block is the charter of the UCL itself, which is virtually a single person ownership. He points out that there are many Indian businessmen sponsoring soccer teams in Russia, and to get them to sponsor cricket will not be a difficult job if their opinions are taken into account in the game’s administration. Clearly, there is still a long way to go, but there is plenty to cheer cricket enthusiasts. The Russian cricket team participated in two Euro 20 tournaments in Wales in 2008 and 2009 respectively and in Macedonia (2010), they were the finalists. These tournaments were recognised by the European Cricket Board (ECB). Cricket celebrities, too, have helped. A few cricket aficionados invited the legendary Indian cricketer - Farooq Engineer – to Russia in 2009 as the chief guest. Ajay Jadeja, a former captain of the Indian team, was the chief guest in 2010. Braving the benumbing cold, hundreds of Indian fans, including many women and children, thronged the stadium. In a lighter mood, Jadeja quipped that he had to keep smiling since morning till evening to please those trying to photograph him. The annual Goodwill Cup match between expats of India and Pakistan has become an other important cricket event. The Goodwill Cup started in 1997 to mark the 50th anniversary of the Independence Day celebrations of India and Pakistan. The then ambassadors of India, Pakistan, Sri Lanka, Nepal and Jamaica graced the occasion. Since then, it has been played annually barring the period between 1999 and 2003, when back the relationship between both countries were going through a rough patch.